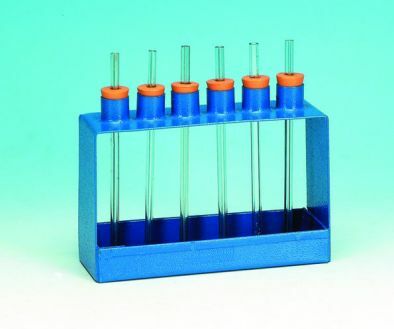 For demonstrating the relationship between capillary pressure and the bore diameter of the capillary tube. The apparatus comprises a metal frame holding six capillary tubes of different bores vertically in a trough. The trough is filled with water and the difference in height of the resulting columns of water is immediately clear. Length of capillary tubes: 150mm.